Are you interested in advertising outdoors but not sure where to start? The advertising professionals at Kirk Donovan Enterprises located in Atlanta, Georgia can help guide you in developing and executing a successful and memorable outdoor advertising campaign that drives consumers to your business. An effective advertising and marketing campaign will incorporate a variety of mediums that reaches the correct audience and gets them to engage with your brand. Outdoor, or Out-of-home advertising is one of the oldest and most effective advertising methods that should be included in your plan. Out-of-home advertising is an effective medium because it reaches a large audience, is less expensive than other mediums, and has many different options or types of ads to choose from. It is important to not think that Outdoor advertising only refers to Billboards. Although Billboards are a very popular and valuable tool, they are only one of many in an advertising professionals kit. If you are enthusiastic about learning how to advertise outdoors and would like to speak with a professional, click on the link below and recieve a free consultation today. Can be used as a Directional Tool - Outdoor advertisements, especially billboards are a great way to point people in the direction of your store location. Adding a simple "Just Minutes From Exit ____" or simply an arrow pointing to your store is a great way to direct traffic to you. Cost Effective - When it comes to the different mediums available in advertising, outdoor advertisements have the lowest cost per thousand views and are not that expensive to purchase. Creates Brand Awareness - Like all advertising, Brand awareness is key to gaining new clients and developing a strong reputation. If you have a consistant message that people see multiple times, you will begin to build trust in your brand among the market. 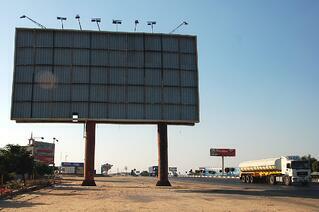 Attention Grabbing - Billboards and other outdoor advertisements are great at grabbing the attention of consumers. By using bold colors, images and a simple message, you can increase the awareness and consumer action for your business. As you can see, out-of-home advertising has many benefits that can help your business reach new customers and drive growth. 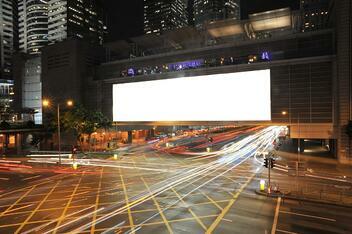 Now, lets take a look at how you can begin setting up your outdoor advertising campaign. When you decide to include outdoor advertising in your campaign, it is important that you understand the entire process. If you are going to do something, do it right. Here are the basic steps to follow when setting up your Out-of-home campaign. Who is your audience? - What are the demographics of your target market? How old are they? Is gender a Factor? Where does your audience live? What is their income level?All of these are factors that must be taken into consideration if you are going to set up an outdoor advertising campaign. What is your Budget? How much money are you willing to spend on your outdoor advertising campaign. Different types of ads cost different amounts of money. To determine your budget, you should do research to find out the cost of the different types of ads available and for what length of time they will be up. Also do not forget to factor in the cost of production of your ads. Where and What Type of Advertisements will you include? - Within the realm of outdoor advertising there are many different mediums that you can choose to use. There are Billboards, Digital Billboards, Moving Billboards, Bus stops, Benches, Posters and many others. The opportunities are endless if you have the right creative team working on your campaign. What is your message? When it comes to outdoor advertising, the key to an effective message is keeping it short and simple. Other mediums such as TV and Radio allow for you to go more in-depth with your message. Outdoor advertising messages are not as flexible. Keep your message focused around one action that you want your audience to take. Once you have an answer to all of the above questions, you are close to being ready to execute your outdoor advertising campaign. However, simply developing a plan and actually executing it are two different things. Using a professional to develop your campaign is always the best way to make sure you get the most out of your campaign. Understanding how to incorporate Out-of-Home advertising into your marketing mix is best done by a team of professionals. An excellent team of professionals will also be able to develop a message and design that resonates with the consumer and gets them to take action. Coming up with the right message, in combination with the right visual is how you effectively reach your audience. 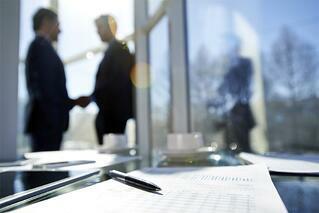 Ad agencies work with the companies that sell the advertising space and know what a fair price is. They also buy larger quantities due to having multiple clients so negioting prices down is very likely. An experienced agency will have many insights that can help to increase the effectiveness of your campaign and get the best prices. When an inexperienced business owner speaks directly with advertisment placement companies, they are at a big disadvantage. These companies are worried about their own bottom line, not yours. Therefore, they will lock clients down in year long contracts and may sell them ad space because it is available, not because it is the best fit. This is why using a professional is so valuable. So, get someone who knows how to negotiate out-of-home advertising companies, how to create realistic expectations, and how to design impactful ads that entice people to respond. Have A Specific Outdoor Advertising Question You Want Answered?